The west tower of St Michael's Church is known as one of the most spectacular Gothic Perpendicular towers in Somerset. It has a particularly elaborate crown - with arcaded parapet and hollow turret pinnacles. 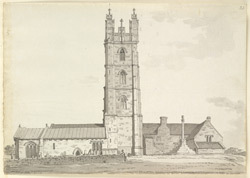 The old church can be seen here but the main body of the church was rebuilt in 1861.